Paintings - "Passing Through Too"
Painted in painstaking Renaissance glazes fairly consistently over a 15-year period, this work has been dubbed by many as “an artistic masterpiece”. 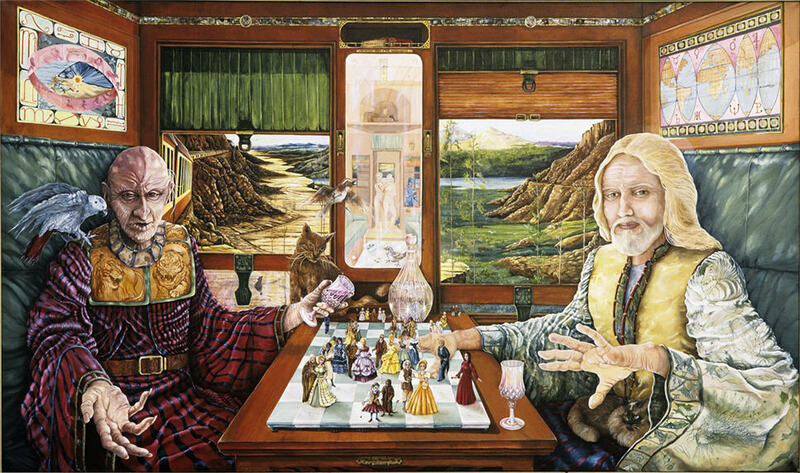 There is a band of 57 miniature paintings within the painting (along the top of the railway carriage in which the embodiments of a unified Good and Evil sit) that depicts the history of art from Anglo Saxon times through to Salvador Dali’s limp clocks. Beneath each faithful rendition in miniature is the artist’s name, and date of death. Within the two larger paintings above each of the almost life-size figures, to left and right, are the symbols of struggle between the sciences and the arts. To the left is depicted the zodiac and the four elements encircling the medieval search for the cosmos; to the right is depicted the positive values of mandalas, the international symbols for the planets, and the map of the world. Within the garment of the figure on the left are embroidered carnivorous animals; within that of the right are herbivorous. And in the center, in the mirror which reflects Adam and Eve (but not the current occupants of the carriage) there is reflected a sacred book, the three seeds of mysticism, and a sparrow on the chess-board, but not the historically garbed figurines that one sees moving in an endless figure-eight about the chess board. And the board itself, on the carriage table between them, has its dark green square to the left, ready for the onlooker, YOU, to play! Each and every thing in the painting, from the variegated screw heads to the leather pull-ups on the windows and the progress of history in the embroidered panels in their garb, as well as the depictions of metamorphosis, renders the painting continually spell-binding. Onlookers have actually stepped back with a shudder when registering the snake lying in wait beneath the chess board! This is a dramatic and mesmerizing work, hardly given credit by the photo at all.